Dermaceutic Sun Ceutic 50 / Gee Whiskers! 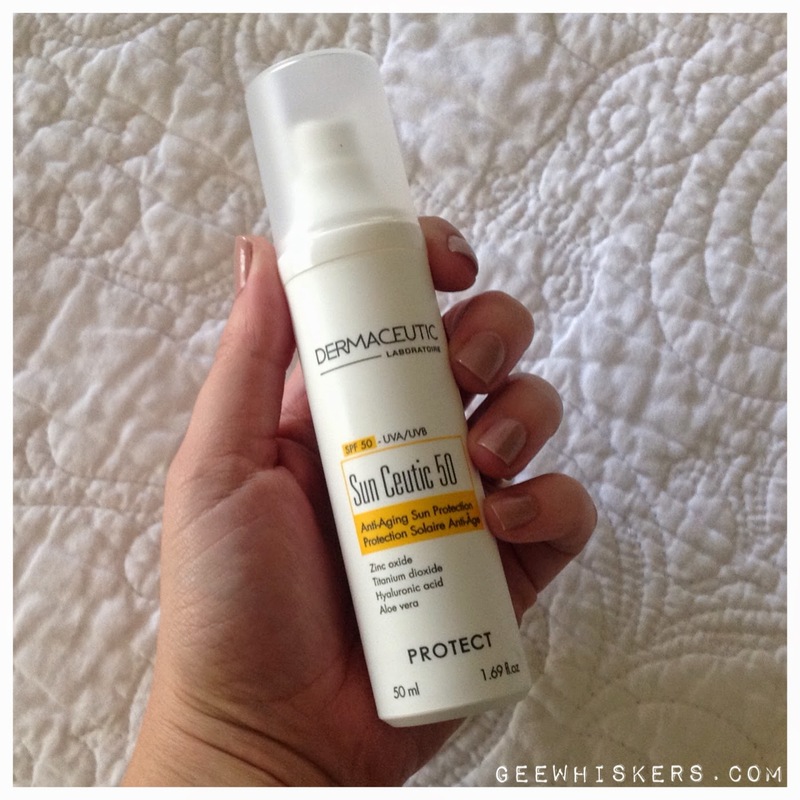 I recently received a bottle of Dermaceutic Sun Ceutic 50 to test out which was perfect timing with spring on our doorstep. In spring and summer it is so important to up the SPF in your skin care products and to find an SPF of 50 in a product is like finding a pot of gold. Sun Ceutic 50 is an anti-ageing sun cream that helps to prevent premature ageing of the skin by providing protection from UVA / UVB rays. The formulation of the product has a stem cell stimulator (EGF stimulator) and repairing ingredients (hyalurnic acid and aloe vera). The ingredients makes this far more than just a traditional sun block cream - this is a treatment product with the benefits of a fantastic SPF. The product is also free os oxybenzone, Octocrylen, Parabens and Fragrance. Zinc Oxide and Titanium Dioxide - mineral filters form a stable physical barrier against UVB and UVA rays. Hyaluronic Acid - moisturises the skin and created suppleness and firmness. This helps to . Aloe Vera - soothes skin and reduces inflammation. This ingredient also stimulates the production of collagen to combat skin ageing. Now for a bit about my experience while using the product. What I love about this cream is how beautifully it absorbs into my skin and doesn't leave any greasy film on the surface. The cream does not have any noticeable fragrance and has a somewhat thick consistency, but once applied it feels light on the skin. What I particularly like about this sun cream is that because it has such nourishing and moisturising ingredients I do not need to apply a moisturiser before application. This is a huge plus for me because I do not like wearing too many layers of products on my skin, especially when it is hot. My skin also never looks dull and pale at all after application. Overall, I am so impressed with this cream and how well it protects my skin. According to the press release prices, a 30ml bottle costs R400. I use 3 pumps to cover my face and neck area which means my 50ml bottle will last me a good 2 or 3 months. For a product that has such great ingredients and sun protection, I honestly believe R400 is an incredibly reasonable price. It is so important to ensure that you have the proper sun protection on your skin and Sun Ceutic 50 is definitely a product I would recommend to anyone.